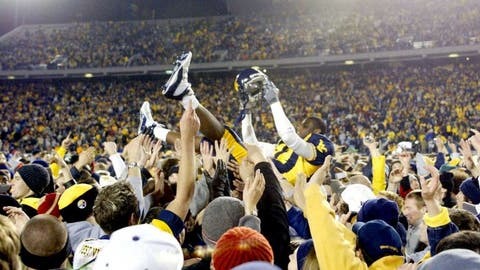 College football rivalries we want to come back! 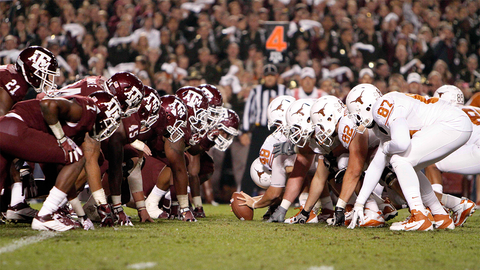 Texas vs. Texas A&M was one of the great rivalries played on Thanksgiving. Here's all the heated battles we miss. The "Border War" began in 1891 with 120 meetings until 2011, making it the second-most played rivalry in college football history. The series is almost even with Missouri holding a 57–54–9 lead. There were some epic battles before the Tigers joined the SEC in 2011. Mizzou won a top-5 showdown in 2007 for a spot in the Big 12 Championship Game. Nebraska dominated this old Big 8/Big 12 rivalry with a 49-18-2 series lead, but Colorado was always a threat to knock off the Huskers. It was a battle of ranked teams in every meeting from 1988-96. One of the most shocking upsets came in 2001 when the Buffaloes routed the No. 2 Huskers 62-36 for the Big 12 North title. Both schools have left the conference since. Nebraska went to the Big Ten and Colorado to the Pac-12 in 2011. A home-and-home series is scheduled for 2018-19. 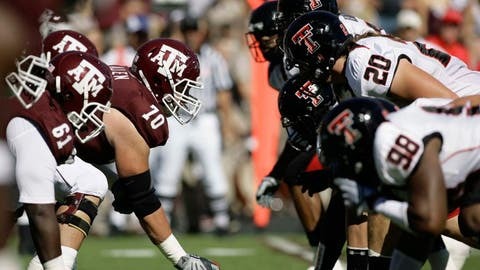 Texas vs. Texas A&M always got the spotlight in the Lone Star State, but the Aggies vs. Red Raiders was as heated rivlary as well. There were many wild games and some nasty battles between fans through the years. One of the most memorable came in 2001 when fights broke out in the stands after Tech students carried the goal post acoss the field following a 12-0 upset of the Aggies. There is no scheduled meeting since Texas A&M left for the SEC in 2012. West Virginia and Virginia Tech had one of college football's most intense rivalries. These former Big East foes played nearly every year from 1952-2005. Arguably the most memorable meeting came in 2003 before the Hokies left for the ACC when unranked West Virginia upset No. 3 Virgina Tech 28-7. The Hokies returned the favor the following year with a 19-13 upset of the No. 6 Mountaineers. A home-and-home series is scheduled for 2021-22. Texas and Arkansas get together every now and then, but this once great Southwest Conference rivalry died when the Razorbacks left for the SEC in 1991. Legendary Texas coach Darrell Royal built the program into what it is today in the 1960s and 70s. His top-ranked Longhorns beat Frank Broyles' No. 2 Hogs in the "Game of the Century" for the national title in 1969. 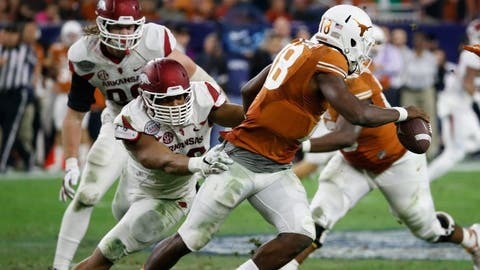 The Longhorns suffered an embarrassing loss to Arkansas in the Texas Bowl last season, managing to gain only 59 yards of total offense in the 31-7 defeat. Texas leads the series 56-22 with the next scheduled meeting in 2021. Pitt and West Virginia are less than 100 miles apart, but the next "Backyard Brawl" is on hold after the Mountaineers joined the Big 12 in 2012. The Panthers dominated the series early in the rivalry's history, but WVU owned the last few decades. One of the most memorable games came in the final years of the series. Pitt pulled off a stunning upset in 2007 to knock the No. 2 Mountaineers out of the national title game. These two college football heavyweights were the Big 8's Thanksgiving marquee game, but the formation of the Big 12 in 1996 changed that. Oklahoma and Nebraska have met in a top 10 showdown 18 times. 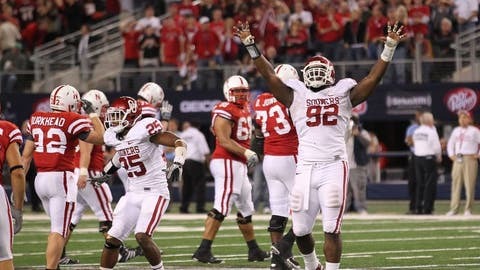 The final meeting as conference rivals came in the 2010 Big 12 Championship Game won by the Sooners. They'll meet again in a two-game series in 2021-22. It was a Thanksgiving tradition for more than a century, but it's much more than football. Both schools have numerous traditions that involve its biggest rival. Wanting to break out of the shadow of the Longhorns, the Aggies joined the SEC in 2011. Texas won a thriller in the final meeting with a last-second field goal in College Station. The Aggies and Longhorns might not play on the field anymore, but they're still fighting for bragging rights in recruiting and in the facilities arms race.